Ultaire AKP is a lightweight, biocompatible, metal-free RPD. This alternative to traditional RPD frames has many advantages over metal RPDs, including efficient digital workflow for lab technicians and dentists and a better fit and esthetics for the patient. Ultaire AKP provides deep undercut engagement and smooth, stationary clasps for a comfortable fit. Ultaire is the ideal solution for occlusion problems, helping to straighten smiles and correct misaligned bites. It uses a special colorizing system to mimic gingiva for a natural appearance, restoring confidence to the patient. 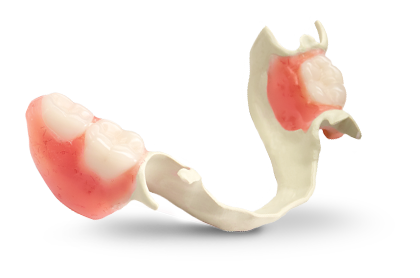 The Ultaire RPD receives high rates of compliance and satisfaction, so it’s an effective option for patients resistant to restoration. It’s well on its way to becoming a popular choice for RPDs.